The word "Dragon" conjures up many different images and feelings in different people... some good, some bad. Interestingly, just about every country in the world has stories of large/small, smooth/hairy/scaly, hot/cold, beautiful/ugly dragon-like creatures. Don't all these stories and descriptions conflict with each other? How can there be a living creature, or even a species, that has such varied characteristics? Maybe... maybe not. I feel strongly that each person is entitled to his/her own view on dragons, therefore what you read here are my own beliefs on what a dragon is. You are free to enjoy my views, or disagree. Just be aware that they are deeply rooted in my psyche and cannot be changed. They are inextricably woven into my understanding of the way the universe works. Also note that this web site is not an encyclopedic listing of all dragons, their eating habits, and physical characteristics... that kind of "information" you can find elsewhere (see the links at the end of this page.) 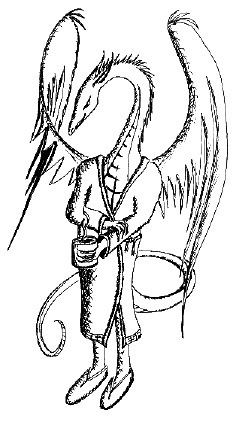 Instead, this page intends to take you on a journey of thought-provoking connections... Dragons with an Eduardian twist, if you will. For the pun-initiated, by the way, a "weyr" is a common name for a dragon's cave or lair. As mentioned above, dragons have been sighted and written about for thousands of years, just about everywhere in the world. They seem to enjoy remote areas just out of range of people, keeping a politely safe distance, but always around. 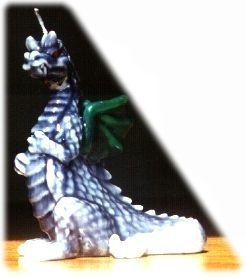 There are mentions of water dragons, land dragons, and dragons that seem to appear and vanish in the skies. There is even a constellation of stars in outer space that carries the ancient name "Drako". It seems that they must live in some place between reality and fantasy, popping into our lives to stir things up, and then dissolving into some unknown "wyrmhole", to return to their own world or dimension until they are called on again, or until they are just bored and need a good smirk. Dragons are often connected, at least in Western Culture, with fighting, chaos, destruction, lust, greed... all things that people secretly enjoy but will not admit to. This probably accounts for the seemingly mutually exclusive feelings of abhorrence, terror, and disrespect, along with fascination, adoration, and reverence that people have for these creatures. They are very good at protecting valuable things (people and treasure), and just as good at destroying things. People see no logic behind when dragons protect and when they destroy. It often seems completely random. However, I must point out that there would seem to be just as little logic behind why the life of a sweet intelligent caring young boy or girl is destroyed by a drunk driver. Our lives are filled with incredibly unbelievably lucky coincidences, and just as many shocking devastations. C'est la vie. That's a silly question, much like asking what God looks like. However, people will do their best to depict what dragons might look like when these creatures poke themselves into our universe for a visit. I too have enjoyed sketching what I envision various dragons might look like, and there are a few of these sketches below. Remember, this is a peek into my mind. Your imagination may vary. 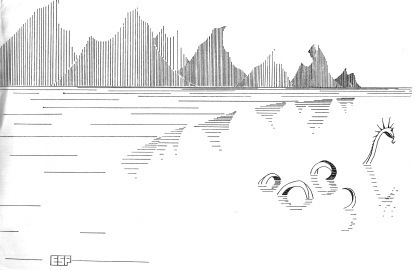 An early surreal sea dragon pencil drawing, sketched when I was 17. 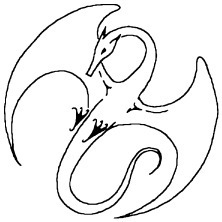 DrakCircle - A logo I designed and later sold to Dragon's Lair Coffee Farm, in Kona, Hawaii. "There really is life before that first morning cup of coffee, but I don't think you want to see it!" 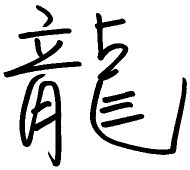 The Japanese and Chinese use the same character/symbol for Dragon, shown above in typeset and handwritten style. The pronunciation differs between Japanese and Chinese, however, and is difficult for Westerners to say properly. In Japanese it is pronounced "Ryuu" (R and Y squished together and a long U sound), and in Chinese, "Lung" (halfway between the English words "Long" and "Lung".) Many thanks to Mihchyn Kong for the above handwriting, and to Apple Computer, Inc. for the "Japanese Language Kit" software, allowing me to generate the typeset Kanji character. And now for something completely different, until you start thinking about it sideways, and begin to see between the lines, and then it may not be completely different after all. 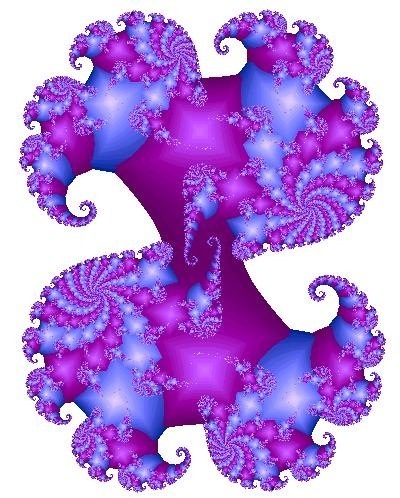 Below is a mathematical equation (and a colored graph) called a Julia Fractal, which uses complex numbers. The paradoxical beauty of fractal mathematics is that such a tersely simple equation can create such a complex pattern. Please feel free to stop a moment, and bask in the ironic coincidence that a complex number is part real, part imaginary. Out at this low magnification, we can see the whole curve. It seems quite ornate and complicated. If you study it long enough, its overall shape may begin to remind you of ocean waves, trees, or broccoli. Notice that even though we have zoomed in much closer, there still seems to be a lot of detail in the curves. This sure looks like a sea horse. But it is certainly just coincidence, right? There is probably no relationship between fractal mathematics and nature.. Hmm... It is rather pretty though. What do you think, is this math or is it art? Or, is it starting to become difficult to tell the difference? ...it is made up of similar replicas of itself, each little sea dragon "building block" just as complex as its enclosing parent. Now this is an intriguing mathematical construct. However, it becomes even more startling when we discover that there really are certain formulas like this that create natural shapes identical to growing plants, or air vortexes over an airplane wing. Now, if you wish to stretch your mind for a moment with me into science fiction or spirituality, imagine this self-similarity at any scale as a description of our universe. Imagine yourself as one of these magnified sea dragon specks. If we zoom way out, does that mean that in a sense, our galaxy is itself a kind of "living organism", swimming along with its neighbors, just as we are, at a smaller scale? And what amazing worlds might then exist at the atomic level? (At this point I can't help but smirk and remind the reader of the paraphrase "God made man in His own image.") And if this is the case, and there is a single relationship or "equation" that describes and connects everything from the subatomic up through the galactic, it would help put into perspective a lot of the seemingly silly and disparate mystical religions that try to describe how man and nature and the universe are all somehow related, and how there are inexplicably coincidental connections between our actions and thoughts, and those of others around us. And one final thought: we humans can only perceive 3 visual dimensions at a time, but have devised mathematical tools to theorize many more than 3 dimensions "out there." For example, the 4-dimensional Julia fractal shape poking through our universe below, is cut into a 3-dimensional slice so that we can see it roll by here. What other things out there might sometimes brush through our 3-D world during their travels? Would they seem to shape-shift, float in the air, move incredibly fast for their size? Appear and disappear at will? Gee, these sound like accounts of dragons to me. 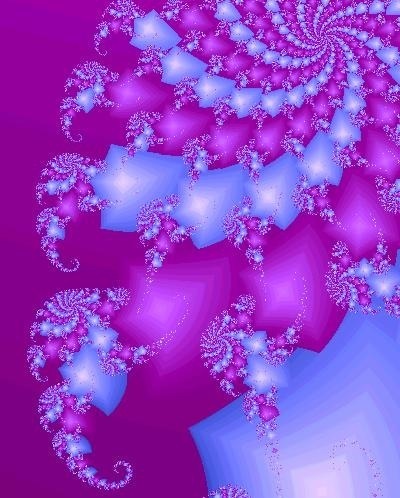 In fact, I could swear I see a dragon shape flash by in this fractal. This is intended merely to be delicious food for thought, nothing more. This fractal shape was rendered with the free POV-Ray ray tracer. Finally, I'll leave you with a poem I wrote long ago, related to all of this in yet another tangential way. Ruth Thompson has some very nice fantasy images of dragons scattered through her laser prints on her web site, which you can buy prints of. Draconic, For Dragons By Dragons is an interesting jumping-off point for various poetry, essays, art, and discussion. McCaffrey, Anne - Any of the DragonRiders of Pern novels..
Prelutsky, Jack; The Dragons are Singing Tonight; 1993; Greenwillow - Wonderful book of dragon poems for adult and child dragon alike. Very good Macintosh shareware fractal image generator, and rich galleries and links. Stunning gallery of fractal images, retouched to enhance their inherent artistic beauty. Macintosh Fractal Software to download at a University of Michigan FTP mirror site. 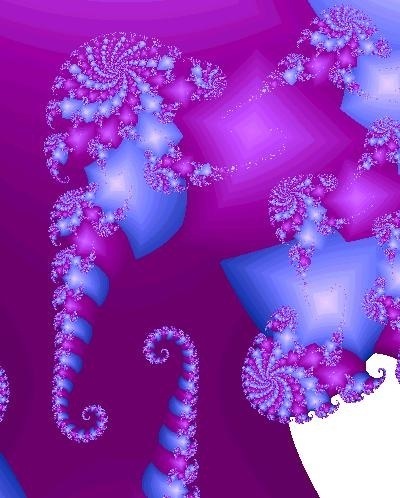 Here are More sites that give lots of background on Fractals, Chaos theory, etc. McGuire, Michael., Mandelbrot, Benoit; An Eye for Fractals : A Graphic and Photographic Essay; 1991; Perseus Pr.